Does a crisis from your past still affect you? Is it hard to dismiss demoralizing experiences, such as the embarrassment over having an alcoholic parent, or the moneymaking scheme that bankrupted you, or the lingering effect of a spouse's unfaithfulness? Such experiences can leave lasting scars, can devour self-worth, and can ultimately leave you feeling isolated and inferior. If left unchecked, the victim mentality can paralyze your heart and mind for a lifetime. For lasting change to occur, you must rely on the truth of God's Word - truth about His mercy, and truth about your worth. He wants to set you free from the past with His transforming power to become all He created you to be! 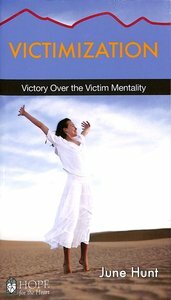 About "Victimization: Victory Over the Victim Mentality (Hope For The Heart Series)"
Do you want to move on from a crisis from your past? Past experiences can leave scars that deteriorate our self-worth, leave us feeling powerless, victimized, and paralyzed from moving forward. June Hunt understands. As an abuse survivor and someone who has been helping abuse victims for decades, she knows healing is a process. Let June guide you through the healing process as she points you to the true source of freedom, Jesus Christ. Has your heart been broken by an unfaithful spouse? Has your life been gripped by the agony of adultery? Has your life been forever changed because of the snare of an affair? Adultery is no small matter, especially for those who experience the intense pain of living with a mate who breaks the marriage covenant. In God, there is hope for you and your situation. Gods uses the marriage relationship to develop sacrificial love, commitment, and forgiveness. Because of God's magnificent grace there is redemption for the adulterer, and God promises to lift up the one whose heart has been broken. Every day there are people breaking free from chemical dependency. Why, then, do some people stay trapped? Why the intense struggle? Can you be set free? The answer is yes --there is hope! The first step to breaking free and staying free is to admit that you are trapped. Then, you must decide that you will do whatever it takes to walk to freedom. The healing process requires active choices on your part. Life is a series of choices. You are only a choice away! Choose to turn to God and live in His strength. He will walk with you each step in your journey to freedom. Has anger ever clouded your judgment to the point that you acted rashly and then regret it later? What do you do when you're inflamed with angry thoughts and feelings? Ultimately, you have the choice to act wisely or to react foolishly. You can learn to keep your anger under control by acting rather than reacting. Debilitating eating disorders are rooted in unmet needs, but there's hope! You can be an overcomer as you discover your incredible worth through God's eyes. Discover a love that will satisfy your starving soul, and truth that will align your thinking with God's. You feel insignificant, deprived, even resentful - these are the side effects of chronic illness that your doctor failed to mention. Although you try to see the bright side, your outlook is often overcast by the chronic nature of your condition. While others appear to enjoy good health and vitality, you struggle for sensible answers. - How can I help others when I can't even help myself? - Is God punishing me? - Has my sin brought on this condition? - If I have enough faith, will God heal me? Even with a chronic health concern, you can experience the soothing balm of God's peace as you apply the biblical prescription for victorious living. And as you do, you can bring encouragement and hope to others who also need God's peace in the midst of pain.